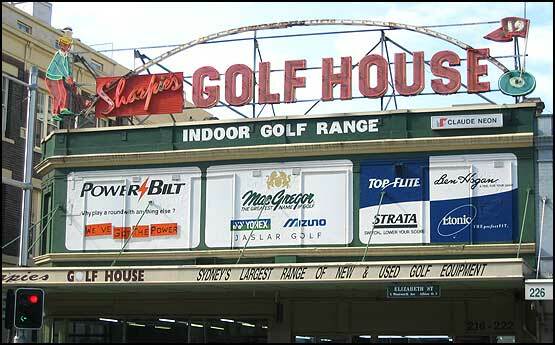 Yes, the kitschy neon sign is what Sharpie’s Golf House is best known for, but there’s a bit more to it than that. For starters, the sign has been gone for years, having been taken down by the City of Sydney in 2007 for ‘refurbishment’. How long does it take to replace a few tubes? 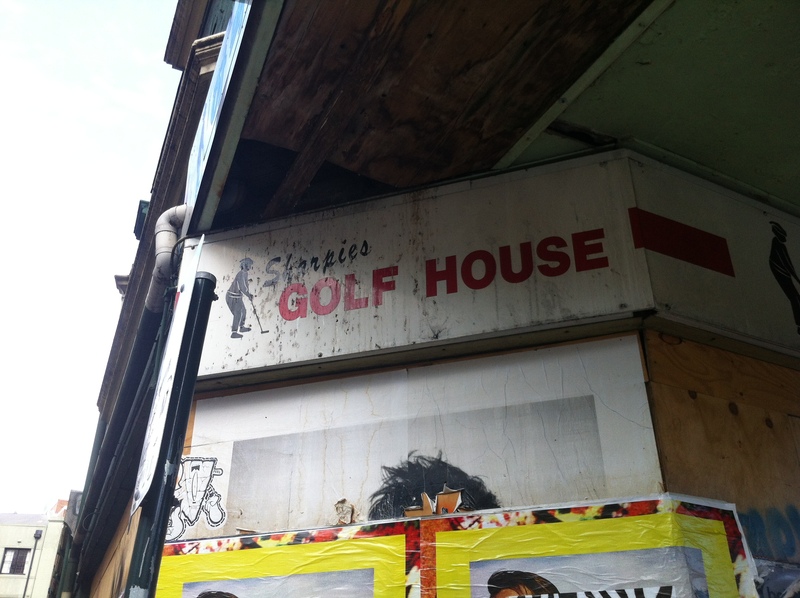 The origins of Sharpie’s Golf House lie in the shop next door. It’s currently the empty shell of the former Gold Sun Supermarket, but in 1918, when Russian immigrant Harry Landis bought it, it was the Railway Loan Office, named for its proximity to Central Station. Landis moved into the current Sharpie’s address in 1923, and proceeded to divide the pawn shop into two sections: musical instruments and sporting goods, with an emphasis on golf. 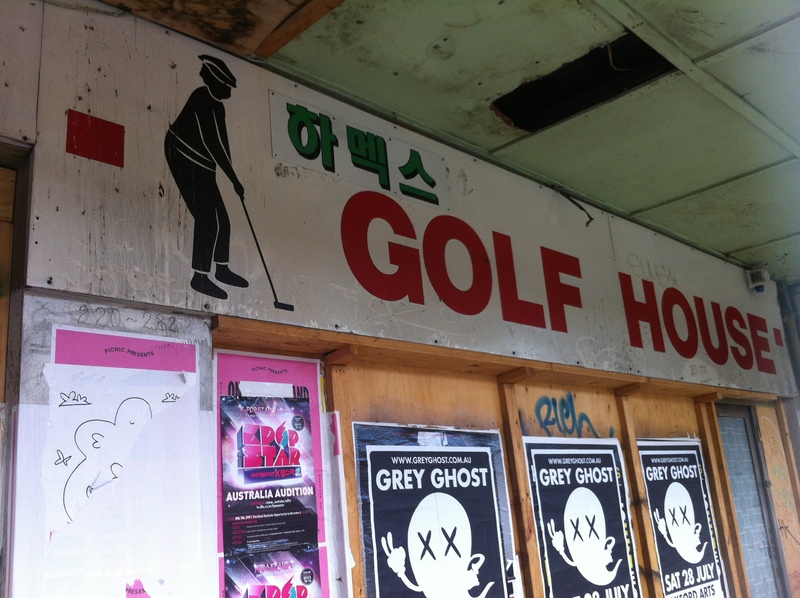 After the Second World War, the sporting side was renamed The Golf House, and in 1964 the animated neon sign featuring the world’s best golfer (he always gets a hole-in-one) was erected after six years of construction. Until its removal, it was Australia’s second oldest neon sign (Melbourne features the oldest. You gonna take that lying down, Sydney?). 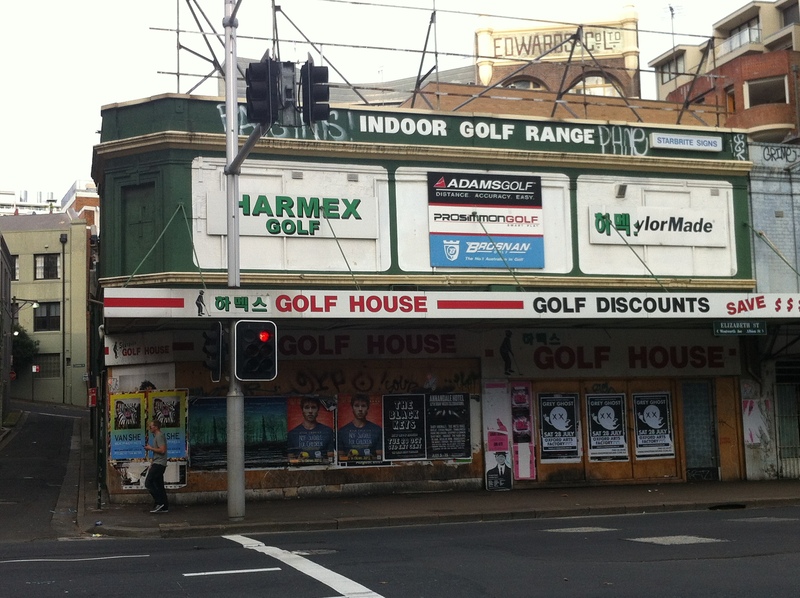 The music business moved to Park Street in 1977, and the Golf House became Sydney’s premier golf store. This prestige attracted pro golfer Lindsay Sharp, who bought the shop in 1985 and renamed it after himself, forcing a change to the neon sign. That’s why the red ‘Sharpie’s’ part looks so out of place. Sharp himself sold the ever-declining business in 1999, and in 2004 it became Korean-owned Harmex Golf, which limped on for a few years before closing its doors for good in 2007. Looking around the area it’s not a surprise – what was once a thriving business zone has become a wasteland with a bad reputation, filled with backpacker hostels and husks of businesses long gone. I’m not complaining; it’s great for what I’m doing. But it’s a sad look for the city, especially so close to the train line. Besides, it’s not like there are any golf courses in the immediate vicinity, so it’s not hard to imagine the golfing community getting fed up with making the trek out here every time they wanted a decent 5-iron. At least they made for good weapons when they stepped back out into the street. The building today is a mess. Sharpie’s has been dulled. It’s dirty, covered in posters and falling apart. Even by Elizabeth Street standards it’s an eyesore. The part I’m having a hard time getting over is the indoor driving range. It had an indoor driving range! For how long? How did it work? I’ve played those virtual golf simulators indoors before, but surely this was set up long before those were around. It’s not even that long a building, how did Sharpie have room to get his drive on? It’s alleged that the sign sits inside, heritage listed, waiting for a spit and polish that’ll likely never come. There have been a few proposals submitted to the Sydney City Council to demolish the current site and reincorporate the sign into whatever is built in its place, but all have been declined. It’s not like they’re going to build another Golf House, so why not just leave it in the past? Why not take the opportunity to breathe some life back into this part of town, and create tomorrow’s heritage listed signs? For all the talk of preservation, Sharpie was quick to flush a 20-year-old sign down the toilet to remake it in his image. It’ll likely go the way of the Regent Theatre on George Street, and we’ll be able to live in Sharpie Tower in 20 years time. There’s something to look forward to. I miss that sign so much, and I’m not the only one. Shame on Sydney Council for letting it rot! Give it to the Powerhouse. Just for the record the sign was initially placed on The Gold House in 1961 by Harry’s half brother Jack Landis who started the golf business from the original pawn shop. Harry only used this site as a store room for his Park St business and was not involved in the Golf business at all. Jack sold the business to Lindsay Sharp and Lindsay added the name Sharpies to the original sign. Do you know what happened to it, Peter? I read on another site it had been sold to Nevada Bob. Do you know if this is true? In the early nineties I lived on the fourth floor of a warehouse close to the corner of Albion and Elizabeth Streets and Sharpie’s was part of the character-filled conjunction of old Surry Hills and Chinatown. I used to buy my mother leather golf gloves from Sharpie’s which stocked the right size for her small hands. Gillian -Sharpies shop was sold in 1999 to Ray Drummond who started the Nevada Bob stores but he continued to trade as Sharpies – he then sold the business to the Koreans – the building as do many in the area belong to someone else! Good article but again, just for the record, Harry Landis Music was operating in Park St. well before 1977, It was the the premier guitar store in Sydney at least in the late 60s and early 70s. I shopped there in 1970. I can remember old Harry himself scaring off young budding musos ogling Les Paul Gibsons et al with barbs like…”this is not a bloody museum ya know”… A great store in heady times. 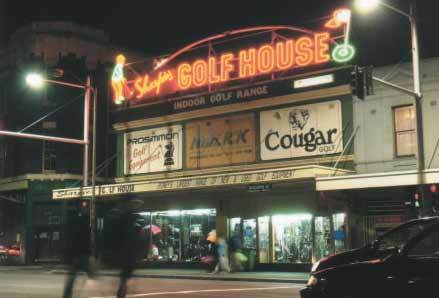 Michael Wayne – when Sharpie bought the Golf House in 1985 the owners wouldnt allow him to trade as ( THE GOLF HOUSE ) so it had to be changed to Sharpies Golf House or the sign had to be switched off. I believe it to be at the Powerhouse Museum – the sign has always been and i believe still is – owned by Claude Neons .